What is an overlap and how can we tell? Many of the comet candidates that have been flagged on Comet Hunters so far have turned out to be cases where an asteroid is “overlapping” a background star or galaxy, and the question has come up as to how do we identify such cases. First, just to explain, an “overlap” is what we call a situation where an asteroid passes very close to, or even over, a background star or galaxy, as viewed in the sky (they are of course very far away from each other in physical distance!). If the asteroid and background object are positioned just right relative to one another, it can make the asteroid look like it has cometary activity, when in fact it does not. 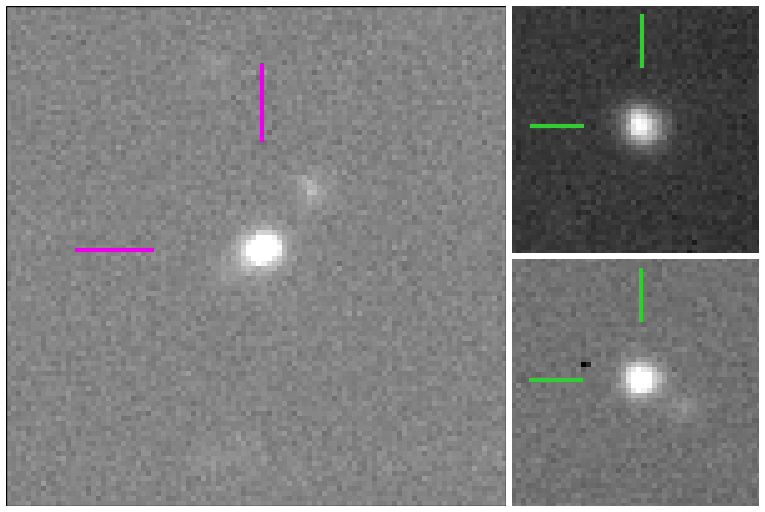 What we do in these cases is go back to the original image and search for other images of the same field, ideally from the same night and same telescope (since this means the images will look similar, having been taken under similar observing conditions and probably with similar exposure times), to compare them. 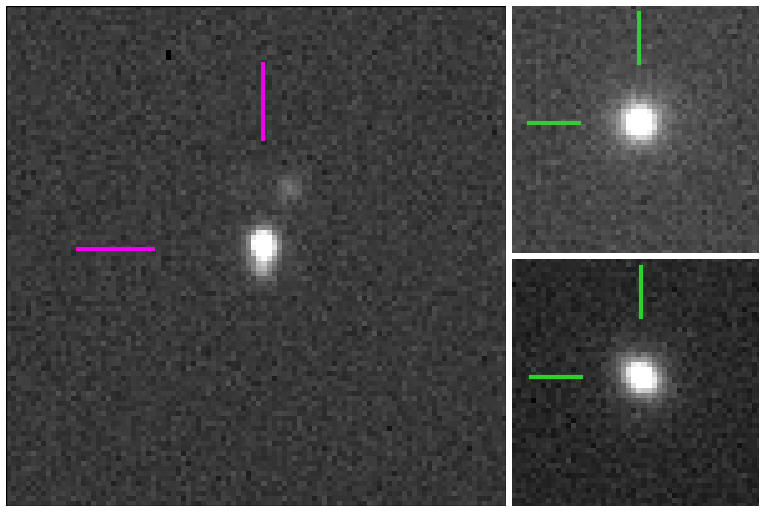 Astronomers often take multiple images of the same field within the same night because they are looking to see how a target changes over short periods of time, or because they want to be able to reduce the effects of image artifacts (adding together multiple images can aid the removal of cosmic ray hits, or by moving the telescope slightly between exposures, they can remove the effects of bad pixels on the detector), so in many cases, we can take advantage of this fact to allow us to check for overlaps. Looking for a consistent appearance between exposures also helps us distinguish real comets from asteroids that only look like they have tails because they are faint, meaning that background noise can randomly appear to mimic activity. 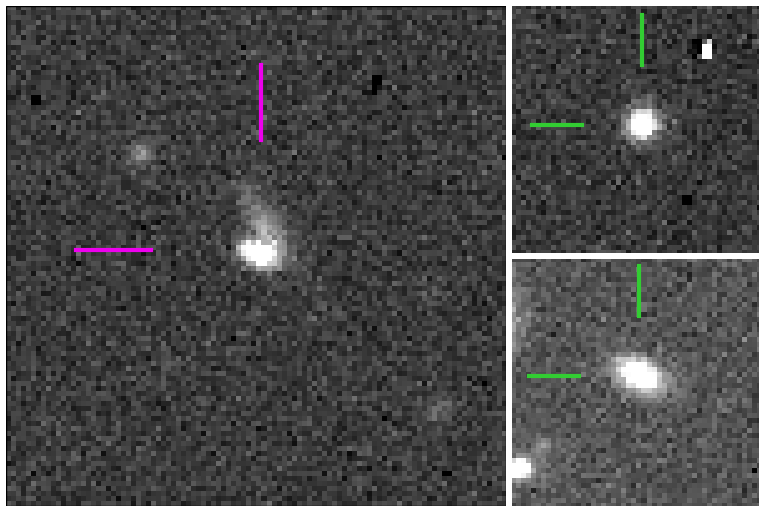 Of course, if multiple images are not available of the same field/asteroid from the same night, this task becomes somewhat more complicated, where we might need to retrieve data taken on different nights or even by different telescopes besides Subaru to see if we can identify a background source at the location of the suspected activity. This is more difficult and may be less conclusive than the method described above because smaller telescopes or shorter exposures or images taken under worse observing conditions may not be sensitive enough to detect the suspected background object, making the check inconclusive. 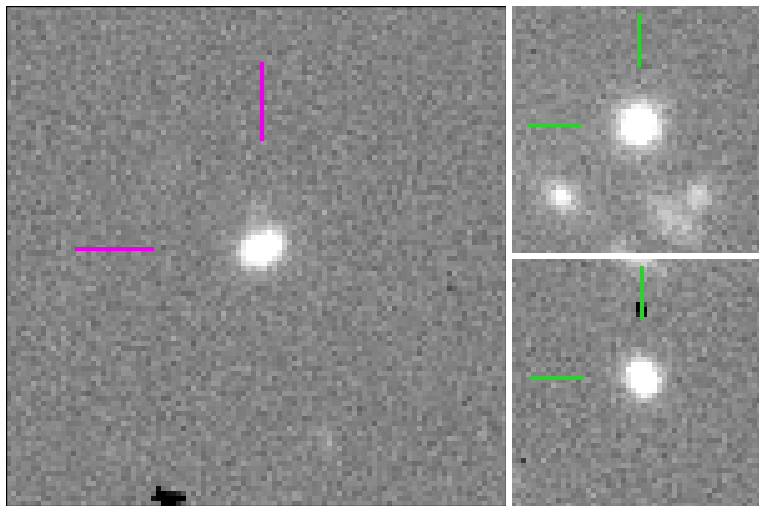 Another check that can be done is to search for other images of the same asteroid taken at a similar time (e.g., using the SSOIS web tool, which we will discuss in more detail in a future blog post), or if that is not possible, then perhaps at least at a similar point in its orbit. If similar activity is seen, then there is a good chance that the activity is real. If not though, then this raises the chances that the original suspected activity was due to an overlapping source, or perhaps just noise or poor observing conditions. It is of course possible that none of these checks will reveal anything conclusive. This is one of the limitations of using archival data, that we don’t have control over the way the data is/was obtained, and so sometimes we will simply lack enough information to directly confirm or reject overlap cases. In these cases, we have to rely on our intuition. Is the star field crowded or not? If it is, it suggests that the likelihood of an overlap is higher since there are more potential background objects to overlap. Is the image quality good or not? If not, it means that it is easier for a background star to be fuzzy and indistinct enough that it could reasonably be mistaken for a tail. Finally, we might also ask if the object’s orbit and orbit position at the time of the observations consistent with those of other known main-belt comets. We want to try very hard to avoid resorting to this particular line of reasoning because it creates a bias against discovering main-belt comets in unusual orbits or at unusual orbit positions, but in the event that no other information is available, we may use this to make a judgement call…i.e., if the orbit and orbit position are consistent with previously known main-belt comets, the object might be considered a stronger candidate than if those are not consistent. We will still not be able to absolutely confirm that the activity is real, but we can put the object higher on our list of candidates to observe in the future when they again reach a point in their orbits at which activity might be expected.